I would really like to see a flitetest review for this plane!? Please! hello friend, welcome to the forum ! a friend of mine have one of those and he stated as his favourite plane ever !! I'd like to see this as well. I've got the L-4 version en route now from the US warehouse. Can't wait. I've managed to score one of these in a scratch and dent sale for almost half price... I'm not a Josh, but I'll certainly take some nice pics and post my thoughts on the plane. I love Cubs, and I don't know why FT hasn't reviewed one yet! Aside from the long list of scale features, I love the concept that this plane can fly around scale on 3s and is blisteringly fast and aerobatic on 4s! But more on this when it arrives. I was thinking of letting this collect dust in a box for a bit, but the more I think about it the more I can't wait to fly it! Wow, I have to say this is an impressive piece of plane. It has serious presence, and a lot of effort went into the dummy engine and other scale detail. In regard to 'scratch and dent', there are a couple of dents in the wings, but are fairly minor. However one of the landing gear arms for holding a spring was broken in the box. To compensate for this, HK have put in a full second landing gear set. But it's for the L-4. No matter. I've got some yellow paint that will match. I wasn't sure what size the prop would be. Turns out it's a 12x9. It just so happens that I have a 13x8 wooden prop, which should make this thing plenty flyable on 3s. I did get a single 2200 4s just in case though. I love Cubs, and I don't know why FT hasn't reviewed one yet! Nice score on the plane. Can't wait to see more. Oh, was that the simulator one? Well, it's together and ready to maiden. It looks a treat with the wooden prop and spring loaded bits everywhere. I'm not sure how long the landing gear will last... I'll try to be gentle. For 3s I need just a smidge of nose weight to get 65mm balance. At WOT it seems to be just enough to get the job done. I didn't fire it up with 4s though, which I'm told turns this thing into a cut cat. as i said before, my friend has one of those and he loves it !! I took the cub out for its maiden yesterday. I changed the prop back to the stock one, as the wooden prop left little margin for error on the clearance side of things. The flying site was the old space tracking station at Orroral. I picked a runway of some smooth, even bitumen which leads up to where a main dish was mounted (the bolts are still there). Before taking off, I ran the motor up - it's very torquey and I backed off before full throttle to avoid damaging the horizontal stabs! This thing would definitely fly OK on 3s, but I bought the 4s 2200 specifically for this plane. After about 5 metres the back end lifted off, but I didn't give it elevator for another few metres for a nice, scale takeoff. A couple of clicks of trim, and it did lovely, lazy circuits on half throttle. It also did nice, lazy rolls and doesn't mind being inverted at all. I practised my landing approach a few times, and as expected it had to be flown in else it starts flopping left and right. The extra power on tap was fantastic and I loved slowing it right down and whacking the throttle up with an instant response. Some people reckon it's fast on 4s, but I don't think it went more than about 60mph - but it's not a racer anyway. On 3s you'd need a little more thought into how you fly it, and probably use a lot, lot more throttle. After a few low and slow runs through the landing area, I started doing touch and goes. One was a little heavier than planned, but it just playfully bounced and flew off. When the battery alarm went off after about 15 minutes of flying, I completed the touch and go circuit and placed it down gently. With the huge wheels, it taxis great, however a lot of inertia is carried into the landing and I used about 20m before it stopped - I didn't have much runway left and my heart was in my mouth. The landing gear seems to be as structurally intact as pre-flight. Maybe there have been some changes to the gear in response to feedback. I'd recommend this to people as a 2nd or 3rd plane for places with an easy approach and reasonable sized runway. It'd stop quicker on grass I suppose... There's little dihedral in the wing, but it's still a stable, mildly aerobatic scale aircraft that flies with your ability. 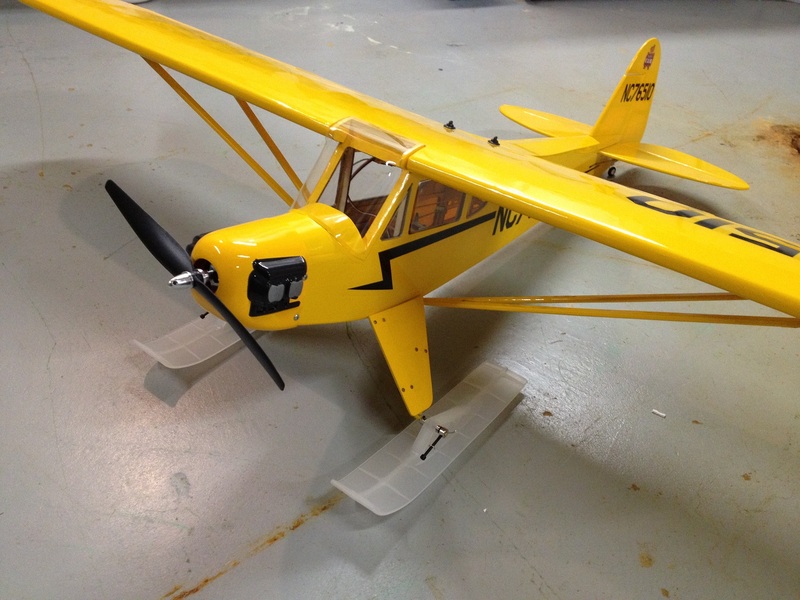 Everybody should own a cub, and if you're wondering which one to get among the crazy range out there (Hobbyking alone have about 10 different cubs to choose from), this would be my first choice. At $140 it's a good value plane with seemingly good quality electronics. I can't help but feel I've scored an unbelievable bargain that I can't fault. Nice review mate this plane is awsome and i plan to get me a cub (rc plane) soon !! The Cub platform is certainly classic, and it's also good for testing. Here's my Black Hawk Cub (60" span) getting set up for some winter flying. The skis are probably a little too large and the springs in them really want to lift the tail, but I think I can make them work. Thanks. I should have said if you're trying to choose a foam one, this is the one. There are plenty of lovely balsa j3 models out there which would definitely be a bit lighter on their feet. since i started in the planes i have my eyes set on the clipped wing cub from HK; some day - maybe when they restock (its been ages on backorder) Ill start my cub project. What a monster of a motor! 11x6 prop seems to be the magic combination for 500W of goodness. DO IT, KKArioKA! That would be one hell of an airplane!